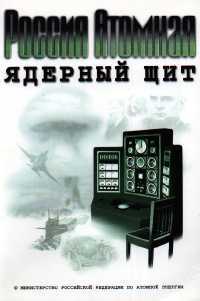 Attention historians of the Cold War: Call us at (800) ULTIMAX to order a copy of our history of the Soviet nuclear establishment in Russian-language on double CD-ROM. This product is unique in the West; no other like it exists. Hundreds of rare archival photos, drawings, and diagrams, hours of exciting film clips and bomb tests, over a thousand pages of text with biographies, maps and tech specs. Only US$53.45 including shipping & handling in the USA. Summary notes about the database: This dataset was compiled entirely from open sources. It helps a lot to have a globe handy and a felt-tip pen when using this dataset. (A cold beer isn't bad, either.) The American portion is complete for codeworded tests in their proper sequence to the present; other countries are nearly so to varying degrees. 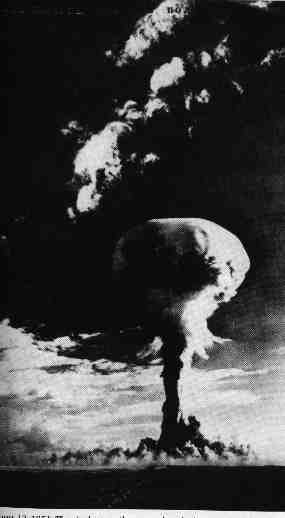 The world's nuclear states have cumulatively conducted very nearly 2080 tests (some consisting of multiple blasts simultaneously or in salvo) since the early morning of 16 July 1945, totaling around 500 megatons. 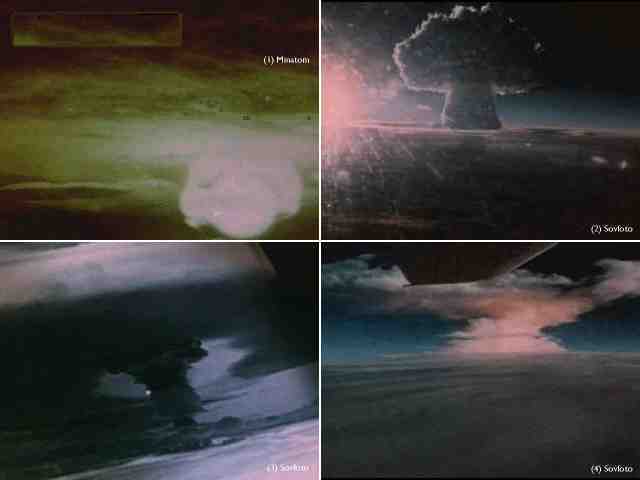 The vast majority of the megatonnage circa 90%, was set off in the open (air, water, space) in a total of circa 619 tests prior to the 1963 Limited Test Ban Treaty. 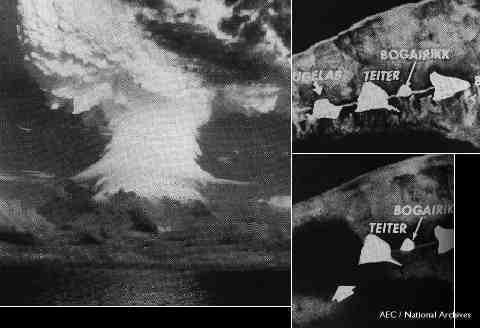 Just over 4 dozen open-air superbomb blasts (which I define as >1450 kt) accounted for over 70% (~360 Mt) of the total test yield in history. A mere half a dozen blasts accounted for almost half (166 Mt) the open-air figure. Americans set off the most blasts, but the Soviets set off the biggest ones and released more energy. With a few exceptions, most of the circa 1460 tests since the 1963 LTBT have been low-yield and underground. 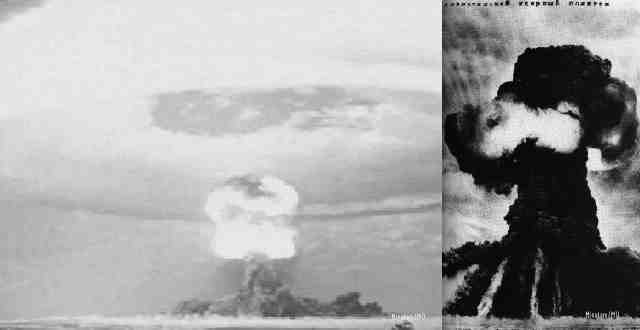 China proceeded from their A-bomb in 1964 to a true thermonuclear weapon in 1967 in less than four years, faster than anyone in history, and without going the plutonium route, and set off only 46 blasts in aggregate. World arsenals peaked in the early 1980s at ~125,000 warheads totaling ~30,000 megatons in aggregate. Present deployed totals are about one-tenth and one-fifth these numbers, respectively. Note that all the individual tests in this database are rated in kilotons, to better enable comparisons. Approximately 10 metric tons of plutonium has been released into the environment, plus vast amounts of other fission products and activated elements. Due to the time sensitive nature of fallout, released activity expressed as "cumulative curies" would not be useful. A rough-order-of-magnitude estimate for the total dose delivered to the biosphere is 2 × 10 24 ergs, or 2 × 10 20 grays [Gy]. Nevertheless, the reader should maintain perspective: the contribution of fallout (~2-4 millirem/year) is about two orders of magnitude less than the sum of what an individual gets from natural background radiation (~85-115 millirem) and technical/cultural sources (~50 millirem). By the late 1950s, the American code word assignment convention had settled on test names drawn from lists of: North American mountains, trees, spicy plants, Native American tribes (North, Central and South), planets and moons in the solar system, North American rivers, fish, mammals (usually small ones of the American Southwest), Shakespearean characters?, Spanish literature (possibly Don Quixote? ), colors, automobiles, mixed drinks, cheeses, golf terms, fabrics, hand tools (probably for Project Plowshare), and nautical terms. More characteristics will have to emerge in order to determine if these lists are correlated with weapon types. To find a particular codeworded test, you can either scan the entire dataset until your eyes glaze over, or you can make use of your browser's no-frills search capability to find it. Again, it's good to have an cold beer handy. Max. shot: 57 Mt N(UK shots) = 4; N(Fr shots) = ? N(UK shots) = 0; N(Fr shots) = 0? Max. shot: 4 Mt N(PRC shots) = >=1? 0500? ddApr?1954 ECHO, failed? wet "Ramrod" design, cancelled? or dud? 18Feb1955 WASP, near surface burst?, kt? 22-23Mar1955 BEE, near surface burst?, kt? 22-23Mar1955 ESS, near surface burst?, kt? 29Mar1955 WASP PRIME, near surface burst?, kt? ddmmm1955 H.A., first high altitude test (not in TEAPOT series) , kt? 09Apr1955 POST, near surface burst?, kt? 05May1955 APPLE-2, near surface burst?, 29 kt? ddmmm1955 PROJECT 56-No.1, near surface burst?, kt? ddmmm1955 PROJECT 56-No.2, near surface burst?, kt? ddmmm1955 PROJECT 56-No.3, near surface burst?, kt? ddmmm1956 PROJECT 56-No.4, near surface burst?, kt? ddmmm1956 LACROSSE, near surface burst?, kt? ddMay1956 YUMA, near surface burst?, kt? ddJun1956 FLATHEAD, near surface burst?, kt? ddJun1956 BLACKFOOT, near surface burst?, kt? ddJun1956 KICKAPOO, near surface burst?, kt? ddJun1956 OSAGE, near surface burst?, kt? ddJun1956 INCA, near surface burst?, kt? ddJul1956 NAVAJO, near surface burst?, kt? ddJul1956 TEWA, near surface burst?, kt? ddmmm1957 PROJECT 57-No.1, near surface burst?, kt? 28May1957 BOLTZMANN, near surface burst?, kt? 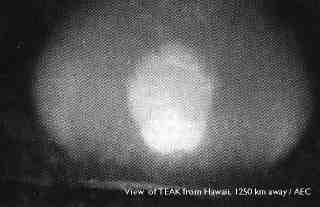 28May1957 FRANKLIN, balloon shot 225m?, W-30 test fizzled 7% of predicted, 0.01-1.3kt? HARDTACK series, Johnston Is., Pacific Ocean, development tests for W-47 dominate, N=39-41? ddOct1958 DONA ANA, burst?, kt? 18Oct1958 RIO ARRIBA, burst?, kt? ddOct1958 SAN JUAN, burst?, kt? ddOct1958 DE BACA, burst?, kt? ddOct1958 SANTA FE, burst?, kt? 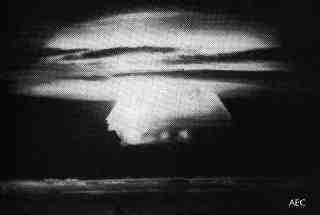 sum US warheads ~20,000 04Mar1961 Soviet nonnuclear test &of #147;System A V-1000 antimissile against RV of R-12. Operatsiya K, Sary-Shagan, Tajik S.S.R. ddmmm1962 HARD HAT, burst?, kt? ddmmm1962 CHINCHILLA I, burst?, kt? 05Mar1962 DANNY BOY, underground w breach, N.T.S. ?, kt? ddmmm1962 CHINCHILLA II, burst?, kt? ddmmm1962 DORMOUSE PRIME, burst?, kt? 14Apr1962 PLATTE, underground w breach, N.T.S. ?, kt? 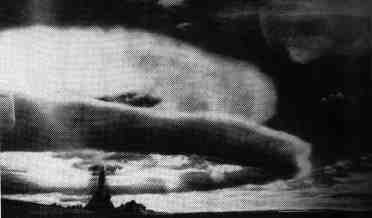 02May1962 FISHBOWL: TIGERFISH, Thor launch from Johnston Is. to hi-alt, test ASAT effects?, z=?, Y=? 19May1962 EEL, underground w breach, N.T.S. ?, kt? 04Jun1962 FISHBOWL: BLUEGILL, Thor launch from Johnston Is. to hi-alt, test ASAT effects?, z=?, Y=? 13Jun1962 DES MOINES, underground w breach, N.T.S. ?, kt? ddJun1962 DAMAN I, burst?, kt? AVENS series when in '70 seq?, French @ N.T.S.? ddmmm1970 CREAM?, ?kt; misfiled from AVENS series? no British tests in 1975? no British tests in 1977? 0053 GMT 22Sep1979 Operation Phoenix? 47.00° S lat × 40° E lon; mysterious double flash in South Atlantic off Africa, low-kiloton, ID = Israeli or South African or both? ; ~2-3 kt? no British tests in 1988? ddmmm1997 HOLOG, subcritical or sub-kt-range? ddmmm1997 REBOUND, subcritical or sub-kt-range? ddmmm1998 STAGECOACH, subcritical or sub-kt-range? 13May1998 test #4?, ~0.3 kt (claimed) / ~0 (actual); fizzle or subcritical? 13May1998 test #5?, ~0.3 kt (claimed) / ~0 (actual); fizzle or subcritical? 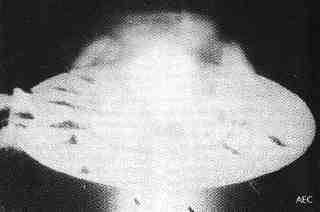 28May1998 quintuple shot: ~28° N lat × ~67° E lon, test #1?, all-U235 implosion based on 20 kt CHIC-4 from Chinese 4th test, 2-6 kt, fizzle? 28May1998 test #2?, all-U235 implosion, 2-6 kt, fizzle? 28May1998 test #3?, all-U235 implosion, 2-6 kt, fizzle? 28May1998 test #4?, all-U235 implosion, 2-6 kt, fizzle? 16Sep2002 US SecDef Rumsfeld states North Koreans have the Bomb during press conference. Existence of test(s) of Pu-implosion weapon not publicly known. 16Oct2002 North Koreans admit to having illegal Pu-fission devices, describe plans for uranium enrichment program. Borovoye archive data for underground nuclear tests at Semipalatinsk Test Site, 1966-1989; http://www.?.? Albright, David, The Shots Heard Round the World, The Bulletin of the Atomic Scientists, July/August 1998, p.20-25. Koch, Andrew & Waheguru Pal Singh Sidhu, Subcontinental Missiles, The Bulletin of the Atomic Scientists, July/August 1998, p.44-49. von Moyland, Suzanna & Clark, Roger, The Paper Trail, The Bulletin of the Atomic Scientists, July/August 1998, p.26-29. various, chapter-article in The Effects of Nuclear Weapons, 3rd Edition, edited by Samual Glasstone and Philip J. Dolan, (U. S. Department of Defense and Energy Research Development Administration, Washington D.C.: 1977), pp. ??:?-?. citing Lewis and Litai, China Builds the Bomb (Stanford UP: 1988). Note: Intensity of blast as measured on Richter scale converted to estimated yield via mag = 4.45 + 0.75log(yield). Note: Chinese satirically named test after date of Soviet memo suspending nuclear cooperation between fraternal socialist allies. This site proudly powered and maintained with All material copyright © 1994-2016 by The Ultimax Group, Inc. This page first posted 10Sep1998; last updated 12 Nov 2016.